Janet and I are in Prescott Arizona for the post-production of our next documentary "Apostolic Fathers: Handing on the Faith." We begin in the mountains with me on the yellow beast. Please pray for us as this is a huge and daunting project. For the next two weeks we will spend six days a week, 14 hours a day in the dark recesses of the edit bay. The first two days we will be out in the mountains filming the last catch-up shots. It is a little cooler up here, only in the high 80's since we are 6700 feet above sea level. Our scenes here will be spilling blood, falling off the stool, the Bible dropping from the sky and me knocking down bushes and trees on a front end loader (yeah, that' me waving from the big yellow beast). 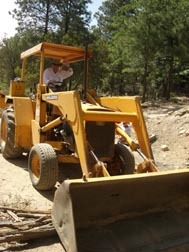 Our story of the Fathers begins explaining how they were trail blazers and road builders. They plowed a road through pagan territory where none existed before. The rest of the time we will be in the edit bay in Mesa Arizona. We plan to have this exciting new DVD ready for sale by October 1. If you are, let us know and I’ll have everyone I know there! Unfortunately I will not be speaking while in Phoenix, unless you can arrange something in July. We are pretty swamped getting the DVD done. I didn’t really try to set up any speaking engagements knowing how busy we would be.